As an expert site about international money transfers we could not have ignored the recent economic earthquake of 2016 – Iran’s financial sanctions and restrictions have been lifted. Even though UK banks and currency firms are still reluctant to send money to Iran, we have summarized the current situation for your convenience. Why have sanctions been put in place? Iran’s interest in nuclear technology goes as far back as the 1950s when a “proposed agreement for cooperation in research in the peaceful uses of atomic energy” was announced. The crisis began in the 2000s when Iran’s uranium enrichment program revealed clandestine activity and drew World Powers’ attention over Iran’s capability to build a nuclear bomb. IAEA (International Atomic Energy Agency) had launched an investigation and concluded Iran’s non-compliance with its NPT obligations, which lead the UN, EU and several individual countries to impose sanctions against Iran, targeting their capability to develop military nuclear activity. When exactly are they lifted and which sanctions are still in place? – Suppression of heavy weaponry supply and nuclear-related technology to Iran. – Asset freezes and banking transactions restriction. – Bans on trading in precious metals and crude oil exports. What brought Iran back in the business was new leadership. Under Hassan Rouhani Presidency, a much more moderate government came in with clear intentions to seek a deal to end the sanctions and save Iran’s economy. Also the new President in the US, Barack Obama, reached out to Tehran to reinvigorate diplomacy. 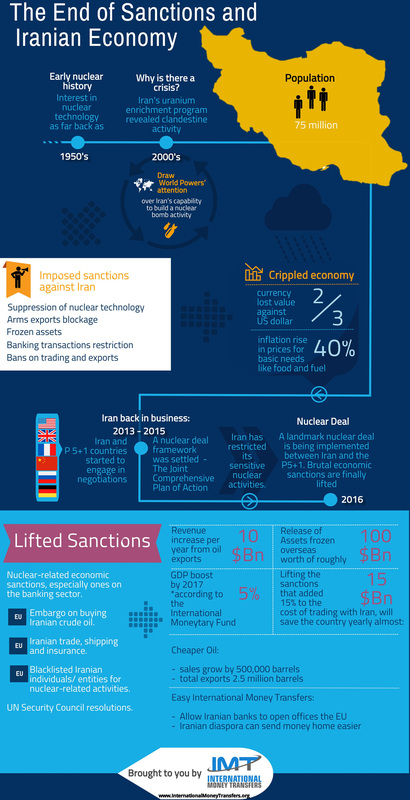 As of November 2013, Iran and P5+1 countries (US, UK, France, China and Russia plus Germany) started to engage in negotiations and in July 2015 a final agreement for a nuclear deal framework was settled – The Joint Comprehensive Plan of Action (JCPOA). So in December 2015, IAEA voted to end its long-lasting investigation into Iran’s military dimensions of the nuclear program. Now a landmark nuclear deal is being implemented between Iran and the P5+1 group, and the brutal economic sanctions are finally lifted as IAEA has certified that Iran has restricted its sensitive nuclear activities. IAEA will continue to monitor Iran’s declared nuclear sites and also verify that no fissile material is moved covertly to a secret location to build a bomb. EU ends all its nuclear-related economic sanctions, including an embargo on buying Iranian crude oil, but the most important of all would be the termination of restrictions on Iranian trade, shipping, and insurance. Also, all the blacklisted Iranian individuals or entities who were banned because of their alleged nuclear-related activities can now do business with the EU. Still, the sanctions referring to terrorism will be excluded. The US will no longer apply its brutal economic sanctions, especially ones on the banking sector. President Obama preferred to issue “waiver orders” for these sanctions as in some cases a complete annulment of these restrictions would require approval by the Republican-dominated US Congress. When it comes to entities accused of sponsoring terrorism, US also keeps its sanctions, and this would be the case of Iran’s Revolutionary Guards or those allegedly linked to it. UN Security Council resolutions that imposed sanctions on Iran’s nuclear program will be annulled. Is the Iranian banking system ready for it? The central bank of Iran says that lifting the banking sanctions will allow more than $30bn in foreign reserves to be brought back from frozen accounts from around the world. The US Treasury says that the figure is closer to $50bn. The biggest impediment in absorbing all the future business and money transaction that Iran will receive in the future is their banking system. And this can lead to less money coming into the country that they will want. Why is that? Well, the main issue is the fact that their relationships with international banking institutions have been cut off for more than ten years, and many companies will be very cautious about re-connecting with the Islamic Republic. “We don’t expect the ‘bitten banks’ to resume relations immediately, but we had very good negotiations with others” said Rasoul Dorri, senior advisor to the central bank governor. “Iran’s central bank has already started reforms for financial stability, sound monetary policy and effective allocation of resources in the banking system” – Valiollah Seif, Central bank chief. In order to develop a fertile place for foreign businesses and increase the chance that more monetary financial institutions will build subsidiaries in the country, CBI (Central Bank of Iran) introduced at the end of 2015 a series of measures to stimulate spending and therefore, injecting more money into the economy. •Cheap loans for those that want to buy homes and Iranian-made cars. •Household credit of $3,000 with low interest. •Infuse $2.5bn into mega projects. •Lowering the bank reserve requirements from 13% to 10%. •Slash the interbank lending rates from 29% to 26%. As of 21 January 2016, twelve Iranian banks (two of the country’s state-run banks and 10 private banks) have been reconnected to the SWIFT system (Society for Worldwide Interbank Financial Telecommunication). Iran’s currency has lost two-thirds of its value against the US dollar because of all the restrictions and isolation from the international banking system. This has caused a 40% inflation and the rise in prices for basic needs like food and fuel. This is why many Iranians are happy to see the restrictions lifted, as they feel that this will help a lot in improving the economy. Ali Vaez, a senior Iran analyst at International Crisis Group, predicts that Hassan Rouhani’s administration will not allow the instant appreciation of the Rial, because it wants to grow the country’s industrial base as well as the non-oil exports. • A revenue increase of $10bn per year from oil exports; considering also other economic predictions for 2016. • Bringing back more than $30bn or foreign reserves that are currently frozen in accounts around the world. • According to the International Monetary Fund, Iran could boost its GDP to around 5% by 2017, from almost zero currently. 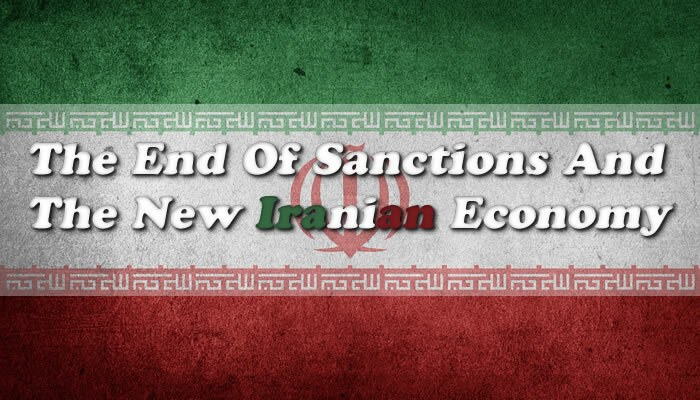 • Lifting the sanctions that added 15% to the cost of trading with Iran, will save the country nearly $15bn yearly. It is also reasonable to believe Iran will be a part of the SWIFT/ IBAN eventually. With the sanctions removed, Iran will be able to export as much crude oil as he wants or as much as the world demand is. Tehran was quick to say that it will increase their sales by 500,000 barrels and increase total exports to around 2.5 million barrels next year. Lifting the sanctions will allow Iranian banks to open offices in any of the European Union member states and this means that money will be able to move easily from and to Iran. 1 – Money is being infused in the country’s economy. 2 – The banking environment will be more attractive to foreign banks. Now Iran will immediately benefit from access to roughly $100Bn worth of assets frozen overseas. Analysts estimate that roughly half of this amount will go to other obligations, as payments to foreign creditors. EU: member states will import and sell Iranian crude oil and gas. US: will no longer ban Iran’s crude oil sales and allow non-U.S. citizens who are part of or engage in transactions with Iran’s energy sector. The ban on these Iranian signature products to the U.S. is lifted. So we can expect that the prices may drop slightly in the US in a couple of years. EU: allow naval equipment and technology trade for shipbuilding to Iran; also allow cargo flights from Iran to access the airports of member states. US: will no longer sanction non-U.S. citizens who are part of the shipping sector in Iran or have financial dealings with it. US: Aircraft will be the only sector where allowed to do business in the Iranian market, meaning U.S. companies will have no restrictions to sell commercial aircraft and parts to Iran. 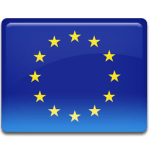 EU: will allow trading of gold and other precious metals. 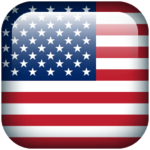 US: will no longer sanction non-U.S. citizens who are involved in trading gold or other precious metals with Iran.